A lot of our posts have been numbers-related, in one way or another, particularly when it comes to air emissions. I’ve discussed the general formula for calculating air emissions, costs associated with SCAQMD NOVs, calculating permit-processing fees per Rule 301, and on and on. But one topic I haven’t yet covered is the different types of emissions you might be calculating for, and this really depends on the situation. 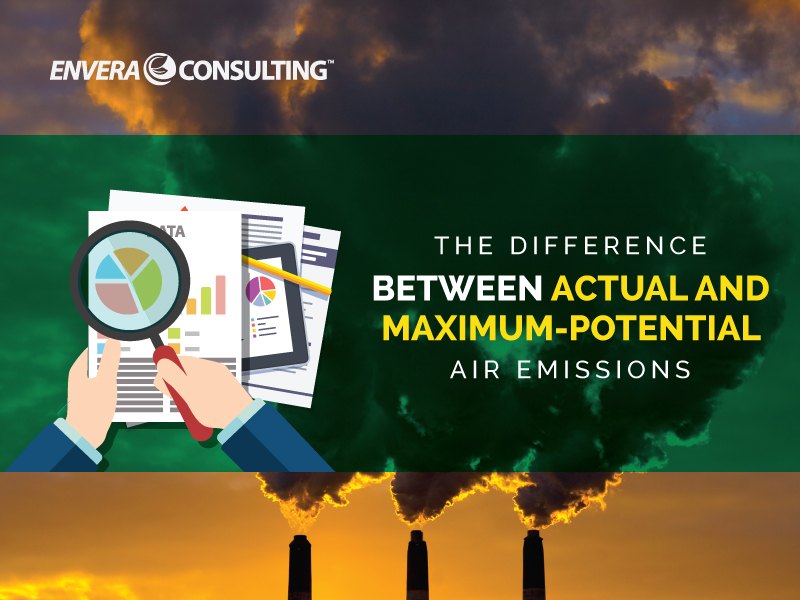 There are only two types of calculations that really matter in our environmental-compliance world: the maximum potential to emit and the average emissions from a piece of equipment. The difference between the two is very important because each could have a very different numerical outcome — and thus affect your project. But although the difference is important, it’s also rather simple. The maximum potential means just what it sounds like: the emissions that would be emitted if the machine or process were operated at 100 percent of its rated capacity, which is often found on the equipment’s nameplate. So one way to calculate maximum-potential emissions would be to take the rated capacity from the nameplate and multiply that by the maximum time that the equipment would be operated. Many facilities operate around the clock, with little downtime, so they might calculate the emission by assuming the equipment will operate 24 hours a day, 365 days a year. But if you’re a smaller facility, such as a family bakery, and you know that you’re only operating that equipment no more than eight hours a day, five days a week, you can use that for the calculation. Then there’s actual emissions. In the vast majority of cases, the actual emissions are less than the maximum potential — which makes sense, because most equipment doesn’t operate around the clock at the nameplate capacity. In fact, I’d venture to say that most equipment operates between 50 and 80 percent of the nameplate. When doing a rule analysis, it can be difficult to determine which rules and regulations apply without knowing the equipment’s emissions. But even before you calculate the emissions, you need to know if you’re calculating the maximum potential or the actual emissions. Generally speaking, permitting usually requires you to calculate the maximum potential emissions. So if you’re determining applicability to the Title V program or calculating emissions for a permit application, you’ll calculate maximum potential. Example situations of when you’ll use actual emissions are when preparing an annual emission report or conducting an annual emission inventory for greenhouse gas. That’s the difference in a nutshell. Any questions?